The age of mass collaboration is challenging the very nature of leadership, yet it also offers unprecedented value for leaders who know how to lead in this new environment. 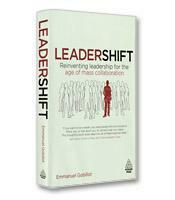 Author Emanuel Gobillot describes how to adapt traditional leadership roles and presents the tools necessary to embrace and succeed in this new age. Leadershift offers a new business model that will allow leaders to engage successfully with communities, recognize and develop talent, and win customer loyalty. Who makes the decisions in a virtual world. How an online community effects change. What social networking means for the way we solve problems. What the online world can teach us about the offline one. How mass collaboration will change the way you lead.